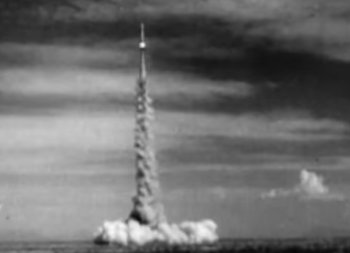 Sixty-five years ago, the United States Air Force conducted a pivotal – and what turned out to be groundbreaking – flight of their Aerobee sounding rocket at Holloman Air Force Base in New Mexico. 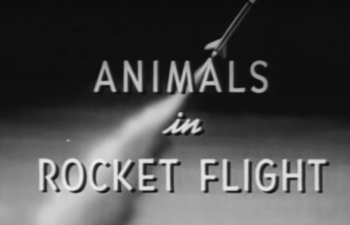 The flight, with one monkey and 11 mice, became the Western Hemisphere’s proof of concept that animals could survive all elements of rocket flight – including landing. It goes without saying that the early years of rocketry leading up to the first human spaceflights were filled with questions of possibility – not just if rocket travel was possible, but whether humans could survive in the environments beyond Earth’s cradling atmosphere. At a time when the United States and Soviet Union were locked in a peaceful yet desperate race to become the first nation to place a satellite into orbit – a race the Soviet Union won – and to place the first human into orbit – a race the Soviet Union also won – the need to ensure that humans could actually survive in space and that the capsule technology under development could support that goal was a paramount aspect of early rocket tests. For the United States, before the creation of NASA on 1 October 1958, the United States Air Force (USAF) played a crucial role in the development of the country’s initial rocket flights – including testing of life support, capsule, and extra-atmosphere flight experiments with animals. Initially, these animal flights were designed to prove that living organisms – that could fit in the limited space available (mice) or had similar physiology to humans (monkeys) – could survive the stresses of rocket flight. The Soviet Union had similar ideas in terms of testing – leading to a slew of flights sending animals to the highest reaches of the atmosphere and beyond. 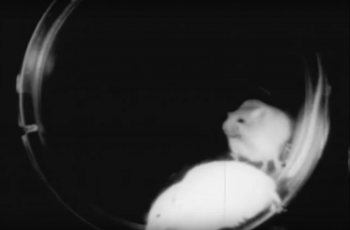 In fact, early experiments and animal flights proved that animals could survive in space with the proper life support equipment and that the stresses of launch did not exceed endurance, safety, and health considerations for them. They also helped engineers better understand the stresses placed upon a living creature during these elements of flight. However, there was a problem – Landing. 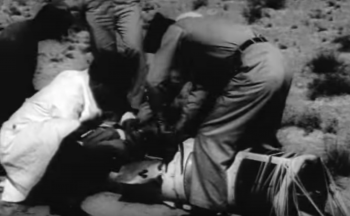 In all of the early tests, USAF engineers struggled with the capsule landing systems and parachutes – struggles which resulted in the crash landing of numerous vehicles and that also dogged Soviet researchers. For the USAF, the Aerobee rocket was selected as the vehicle of choice for early animal launch and landing tests following four V2 rocket flights with monkeys – all of which were unsuccessful and resulted in the deaths of the monkeys. V2 rockets were expensive to operate and were in limited supply following World War II, necessitating the creation of the Aerobee, a small, 8 m, unguided suborbital sounding rocket built by Aerojet General which – in its initial iteration – could reach a maximum altitude of 230 km (142.9 miles) if it didn’t carry a payload. That number, with a 68 kg payload, reduced the rocket’s max altitude to 130 km (80.7 miles). The rocket itself was comprised of two stages, with a solid fueled boost stage (first stage) and a nitric acid/aniline sustainer (second) stage. The first Aerobee was launched with no scientific instrumentation on 24 November 1947 from the White Sands Proving Grounds in New Mexico, USA. It reached a maximum altitude of just 55.8 km (34.7 miles). The first Aerobee to carry scientific instrumentation – to study cosmic radiation – was the fifth Aerobee (Aerobee-5); launched on 5 March 1948 from White Sands, it reached a maximum altitude of 117.5 km (73 miles). As the 1940s drew to a close, the need to conducted medical tests for proposed human flights to space became apparent. For these tests, the USAF turned to the Aerobee rocket for a series of planned aeromedical flights that would carry monkeys and mice to the upper reaches of the atmosphere. The first Aeromedical Aerobee flight (Aerobee-12) took place on 18 April 1951 from Holloman Air Force Base at White Sands carrying a single Capuchin monkey. By all accounts, the flight looked as if would be a success, with the rocket carrying the monkey to its designated high altitude before beginning the return trip to Earth. However, during descent, the parachute failed to open and the monkey died on impact with the ground. This first Aeromedical Aerobee flight proved that an animal with similar physiology to a human could survive the stresses of launch on a rocket. However, the flight also demonstrated the concern regarding safely landing a capsule after flight. While the USAF examined the failure of the Aerobee-12 medical flight, the Soviet Union geared up for their own medical flights with animals. On 22 July 1951, the Soviet Union carried out the first completely successful biomedical rocket flight with dogs and other small animals. 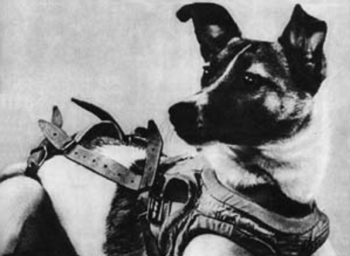 The Soviet flight reached an altitude of 100 km (62.1 miles), and both dog occupants were successfully recovered from the spacecraft following landing – marking the first time animals were successfully recovered from a spacecraft and proving that Soviet technology could successfully launch and return a living being. The Soviet Union conducted five more flights with dogs to altitudes of 100 km, three of which were successful, throughout July, August, and September 1951. 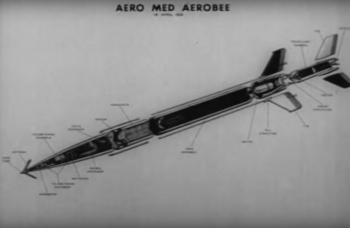 For the USAF, engineers studied the issue that plagued Aerobee-12, implemented modifications to the rocket’s parachute design, and proceeded toward a second Aeromedical Aerobee flight (Aerobee-19) in September 1951. For Aeromedical Aerobee-19, the rocket was not just loaded with a monkey – this time a rhesus monkey named Yorick – but was also loaded with 11 mice as well. Dubbed the “arkful of animals” flight, Aerobee-19 launched on 20 September 1951, reaching an altitude of 72 km (44.7 miles) before beginning its descent back to Earth. Where the Aerobee-12 flight failed, Aerobee-19 succeeded, parachuting safely to the New Mexican desert with all 11 mice and its rhesus monkey occupants in healthy condition. However, technicians were not quick to recover the capsule, which sat in the hot desert sun inside an unventilated capsule. Yorick and two of the 11 mice died of heat prostration awaiting recovery – making the flight only a partial success in terms of its overall goals of proving that recovery was possible and safely recovering all animals. Importantly, though, Aeromedical Aerobee-19 was a huge success for the U.S. human rocket industry in that it proved that U.S. technology could successfully launch and land living creatures. Eight months and one day later, on 21 May 1952, the third Aeromedical Aerobee flight (Aerobee-26), launched with two Capuchin monkeys – Pat and Mike – and two mice. 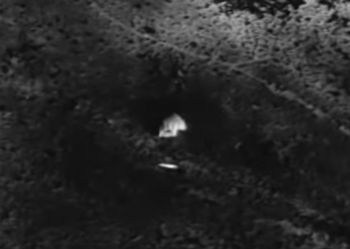 The flight reached 57.9 km (36 miles) in altitude before successfully parachuting back to Earth. Using lessons learned from Aerobee-19, teams quickly recovered the capsule and removed the monkeys and mice – making Aerobee-26 the first U.S. rocket flight to successfully recover all living occupants from a capsule. Moreover, it confirmed the Aerobee-19 findings that a successful launch and landing were possible with U.S. technology. These initial capsule habitability and launch and landing tests proved immensely useful for USAF and eventually NASA engineers as Project Mercury kicked into full gear in 1958. Nine and a half years after Aerobee-19 proved that launching and landing living creatures with U.S. technology was possible, Alan Shepard became the first U.S. person – and second overall person – to travel into space on 5 May 1961 on the Freedom 7 suborbital flight from Cape Canaveral.